2015 – Sorry – these courses have been discontinued after several years of happy customers! You can find much of the information in my books for authors here. Do you want to know how to build, improve or optimise your writer/author blog? Simon & Schuster, one of the top publishers, now recommend that authors should have a blog. As much as we sometimes wish it wasn't so, book publishing is a business and in these times of decreasing margins, your publisher wants as many marketing guns firing as possible! 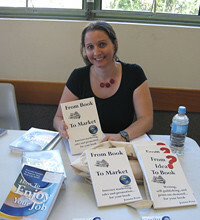 If you are a self-published author, you definitely need one in order to sell your books. If you haven't started writing yet, or have a work in progress, you need to start building your author platform now so you have customers ready in the future. Blogging is also relevant for fiction and non-fiction authors of all genres and niches. Top author blogs include diverse individuals such as multi-award winning fantasy author Neil Gaiman, spiritual Paulo Coelho, and business author Tim Ferriss. These authors have sold millions of copies, so if they still blog in order to sell books, then we should definitely be! If you’re after a ready-made ‘how-to guide’, Author 2.0 is your answer! It gives you all all the help you need from someone who’s right in the thick of it (me!) There are plenty of pitfalls for the unwary and I’ve made a ton of mistakes – so I can show you what not to do as well as what to do. I love sharing information for free on this blog, but a number of people started asking for an encapsulation of ALL the information in one spot, as well as extra material on blogging specifically. Last year, I released the Author 2.0 Blueprint and a full 12 module online course that teaches writers/authors how to use web 2.0 tools to write, publish, sell and promote their books. A few months ago, I asked what would be most useful for authors/writers and 74% responded that they want to know how to create and maintain a fantastic blog. So now “How to Blog for Authors/Writers” is available as a stand-alone product. I have rewritten the material, rerecorded the videos and added a load of new material to it, as well as adding the bonuses below. It’s an inexpensive way to get hundreds of hours of my experience – the challenges, the solutions, the short-cuts and the ideas that work. Don‘t make the same mistakes I did! I can show you how to get a blog going in no time at all that will give you the ability to really hone those writing skills and start developing a market for your books. Unsure of how to start a blog at all? Unsure of what to write about? Ready to take your basic blog and make it stand out from the crowded marketplace? As a writer you have a head start on almost every other blogger out there! You already have the skills you need to entertain your readers, now here are the technical skills for blogging, including design tips and content marketing information to make a difference to your book marketing efforts. Exclusive audio interview with 6 figure blogger, Yaro Starak from Entrepreneurs Journey (37 mins) + transcript of the interview with links and extra information. Yaro has been blogging for many years and makes a fulltime income from his blog. In the audio and transcript, he outlines tips for blogging and also how to make money from your blog, and why writers have a real advantage as bloggers. Exclusive audio: Blogging for Authors with Joanna Penn. (1 hr 8 mins) on the material covered in the ebook. Video: Author Branding (28 mins) How to decide on and create your author brand. Video: Behind the scenes of a blog (34 mins)including the key aspects of a blog. These videos are done by recording my desktop, so you see the actual software as well as hearing me talk about the topic. BONUS: Teleseminar Q&A audio recording and transcript containing questions from other authors and writers who have the same issues you do. Why would you listen to me anyway? 73,393 unique visitors since starting the blog in Dec 2008, which grow weekly. I attribute all my income as an author/speaker to this blog. It includes book sales (ebooks and print), Author 2.0 course sales, and speaking events I have done based on my online profile. You can read testimonials about my courses, speaking and more here => Testimonials page . The course material also includes the exclusive interview with Yaro Starak, a 6 figure blogger so you get a real pro giving you advice too. There is 100% money back guarantee if you are not happy with the material, or it is not useful to you. It is very important to me that you get value for money so I absolutely stand by this guarantee. Once you click the Add to Cart button, you will be directed to payment through Paypal which is a trusted, secure internet sales provider. After payment, you will immediately receive a Welcome Pack that includes the logon details for the online materials so you can get started straight away.